In our very first head-to-head battle of the playoffs, the #1 seeded Blue Dot squared off against the #4 Tin Cow. Our Judges decided to eat BOTH burgers in one sitting to evaluate these burgers at the same time under the same conditions. The Preacher actually took his brown bag from the Blue Dot straight into the Tin Cow and had his own personal showdown between the two. Look, both of these burgers are great. Period. You know that. These are two Pensacola heavyweights slugging it out. At the end of the day, our judges agreed that the Blue Dot was the winner of this matchup by a narrow margin. That doesn’t take anything away from the Tin Cow. The Tin Cow is hands down our favorite stop for unique toppings- but their standard burger fell short to the Blue Dot this time. The Blue Dot (as you know) is the only burger that you can eat and not notice that it didn’t come with cheese. The Blue Dot is just plain ol’ goodness wrapped in a foil wrapper. In this round the two new kids on the block squared off to compete for the final spot in the Championship. Again, two fantastic burgers. How could we eliminate one? We had to. The “OP” burger was cooked perfectly (as always) and has become a model of consistency. Consistently great. As for the Pot Roast and Pinot Burger- almost every Panel member can now pronounce the word “pinot” without embarrassing the group. The PR&P burger makes you drool. Not metaphorically- literally. Our Banker says it’s quite possibly be the best burger he’s ever tasted. The Coach agrees. At the end of the day our Accountant and The Yankee called it a draw. They could not decide between these two fantastic burgers. The remaining Panel Members tabulated their scores and the Pot Roast & Pinot burger barely hedged out the Other Place. 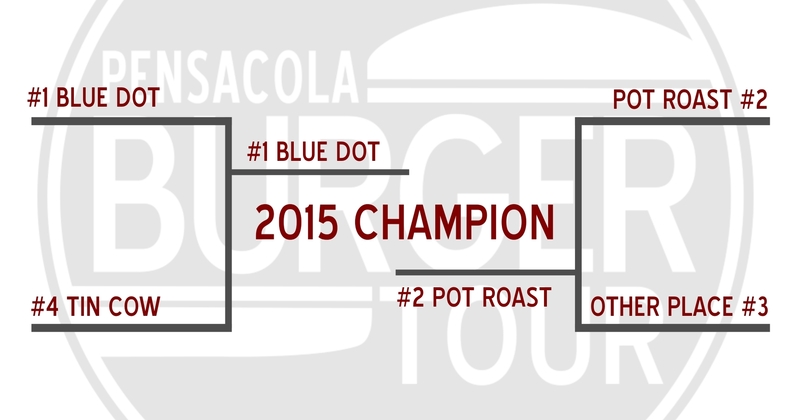 That means our Championship Round (next week) will feature the #1 Blue Dot burger vs. the #2 Pot Roast & Pinot burger. Can the Blue Dot defend it’s title? Is the Pot Roast Burger the NEW best burger in town? Check back next week when we crown a winner.